It has begun! June 19-30. Don't Starve is going for $4 today. Anyone play it? I've always been curious about that game. I bought Octodad and 7 days to die. Gotta get that steam fix, tap tap tap. Frost sold me on getting State of Decay III... and it went on sale, so I grabbed it :/ Damn you frost. When did they release the two sequels? well, its the way they have the title/graphic, it looks like it has "IIIIIIII" or whatever roman numeral on it. And thus concludes your roman numeral mini-tutorial of the day. Something I don't like in roman numerals is years... for example.. my birth year 1978 is MCMLXXVIII in roman numerals. Although the Romans did use IIII for 4 as well... cheeky buggers. Well, what I know for sure though is they just don't keep on adding I's for further numbers. So 8 is most definitly not IIIIIIII and 10 is NOT IIIIIIIIII! 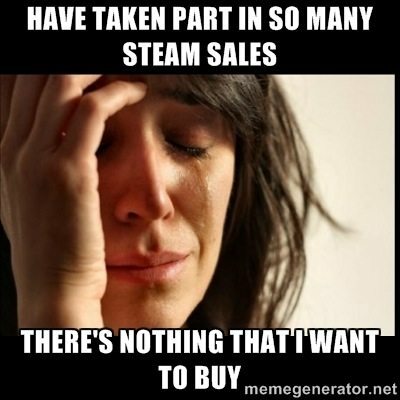 BTW, I can't partake in any steam sales right now because I'm flat broke at the moment sadly. Stanley Parable is 60% off. Sounds like my kind of game..
Tomb Raider is heavily discounted... tempted. Deus Ex HR DC is down to five bucks. And on Frost’s wishlist, apparently. Borderlands 2 GOTY is $20, so I might finally get it. Worth mentioning, MacGameStore has their own competing sale going on now too. Well worth a look, especially since they don't yank down a deal after 24 hours. MGS has matched that price, FYI. Steam dropped the price on BL2: GOTY to $9.99 yesterday, so that clinched it for me. However, I did pick up Bioshock from the MGS for $4.98. Not available for the Mac on Steam, and I've been curious to try out that series. Bioshock 2 is only $4.99 on the MGS, so that may end up in my cart too if I like the first one. Drat, I got my first dupe trading card. #7. I will wait till near the end (before they expire) to do 1 for 1 trades of what I'm missing. Faq I always get duplicates. Check my inventory, see if there is anything you need. I have 3 #3's. I need 5, 6, 8, 9, 10 if anyone has any of those they'd like to trade for a 3. I'm sure I'll have more dupes by the end of this hehehe.